You probably never thought of the Shetland Islands as a travel destination, and if you did, it may only be because of the famous miniature ponies of the same name. Or perhaps you’ve seen some episodes of the popular BBC Shetland detective series. What you may not realize is that these islands have some of the most spectacular scenery in the British Isles, historical sites that go back 5,000+ years, a hospitable and friendly population, and diverse visitor amenities. 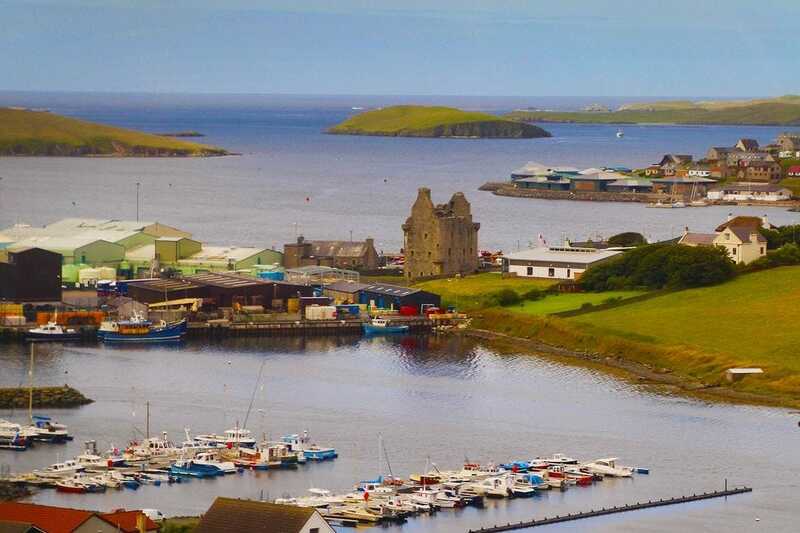 When you look down on the picturesque fishing village of Scalloway from the hill above, you’ll see the well-preserved ruins of a castle, built in 1600, right in the middle of town. The castle is open much of the time and there is no admission fee. If it happens to be locked when you arrive, you can pick up the key from the front desk of the nearby Scalloway Hotel. The miniature Shetland ponies, which range in size from 28 inches to a maximum of 42 inches, have existed on the Shetland Islands for over 2,000 years. This hardy and strong breed was first used for pulling carts and plowing farmland. Today, they are ridden by small children at horse shows, and can be seen in harness at festivals to provide short carriage rides. They are very intelligent and have even been trained as guide horses to take on the same role as guide dogs. Don’t leave the islands without sitting down to a cup of tea, accompanied by the best Scottish shortbread you'll ever taste. 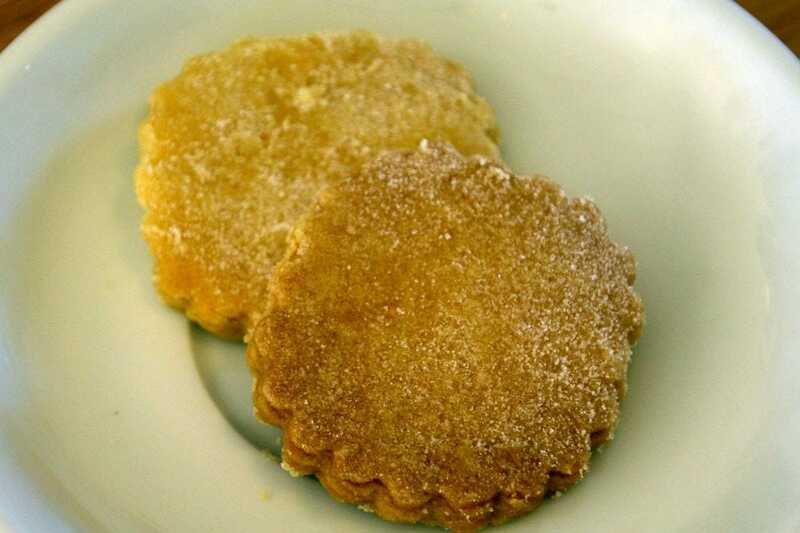 The biscuit originated in Scotland, with the first recipe printed in 1736, and contains just three ingredients: white sugar, butter and oat flour. It melts in your mouth! 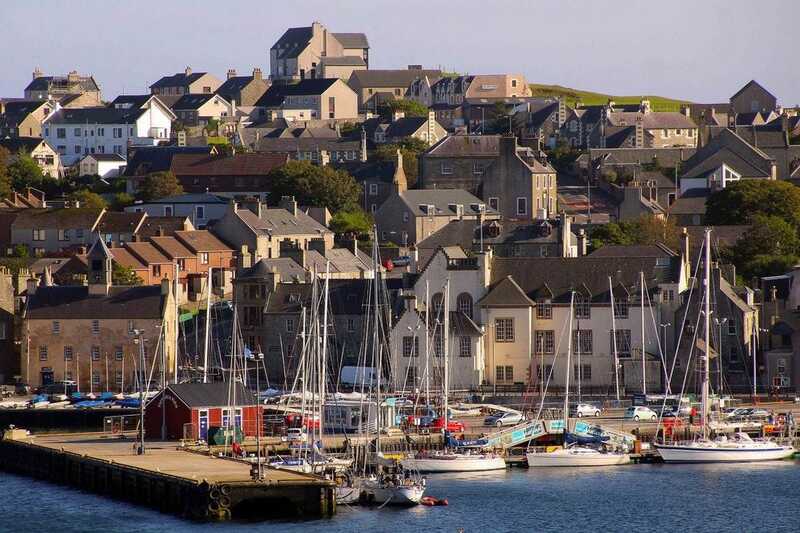 The charming city of Lerwick, Shetland’s capital and commercial center, is also the hub of a busy cultural and social life. Evidence of human settlement in the area dates back 3,000 years, but the current town was founded in the 17th century to service Dutch herring fleets. 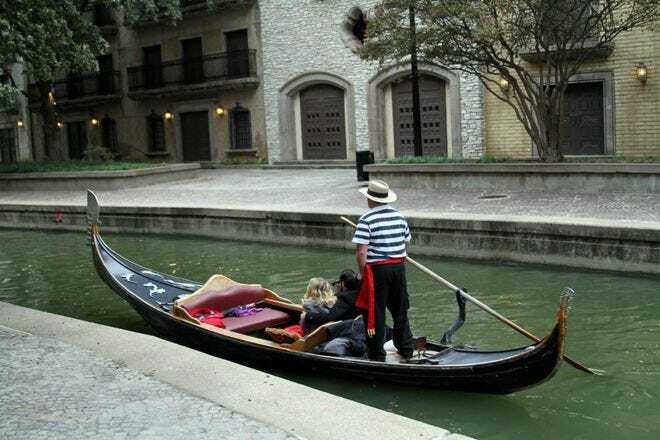 It’s a perfect place to stroll and discover, from the picturesque harbor, past waterfront buildings from the 18th century, and up to the Victorian "new town" with its magnificent villas and public parks. 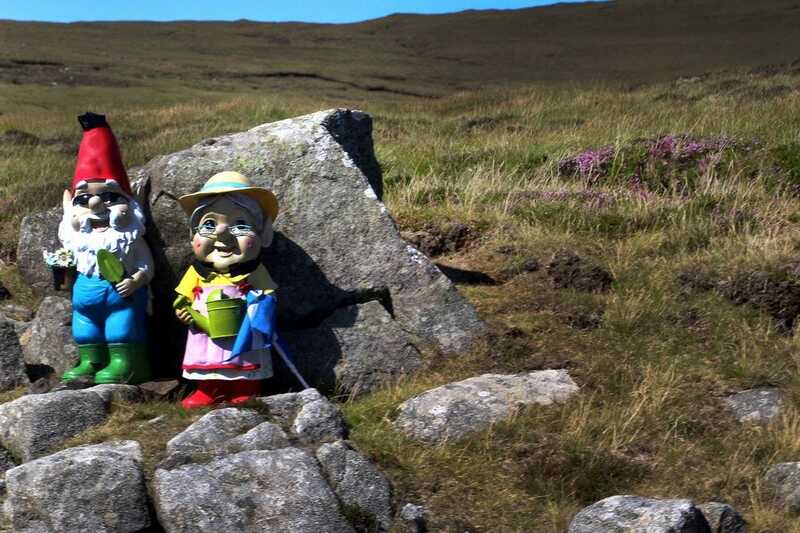 The Shetlands are, for many visitors, several destinations rolled into one. The main island, appropriately called "Mainland," gets much of its beauty from its diversity. 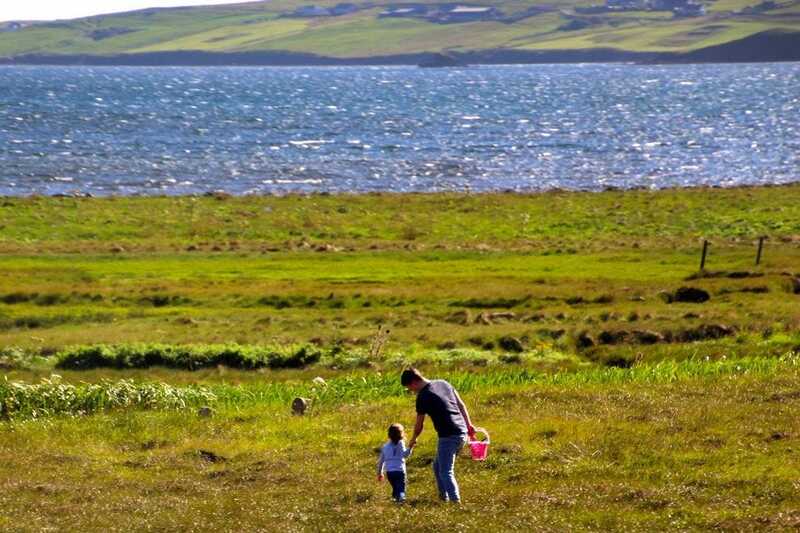 On a drive from Lerwick to the scenic northwest corner of Mainland through the Tingwall Valley, you’ll pass lush farmland and dreamy meadows, freshwater lakes and grassy hills. You’ll note the Nordic influence of many of the houses along this route. 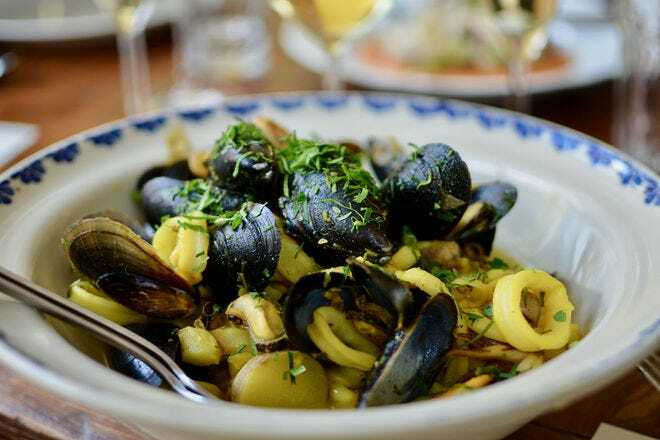 If you visit, it may come as a pleasant surprise that the Shetlands offer a surprising array of distinctive food and drink, from traditional to modern gourmet. 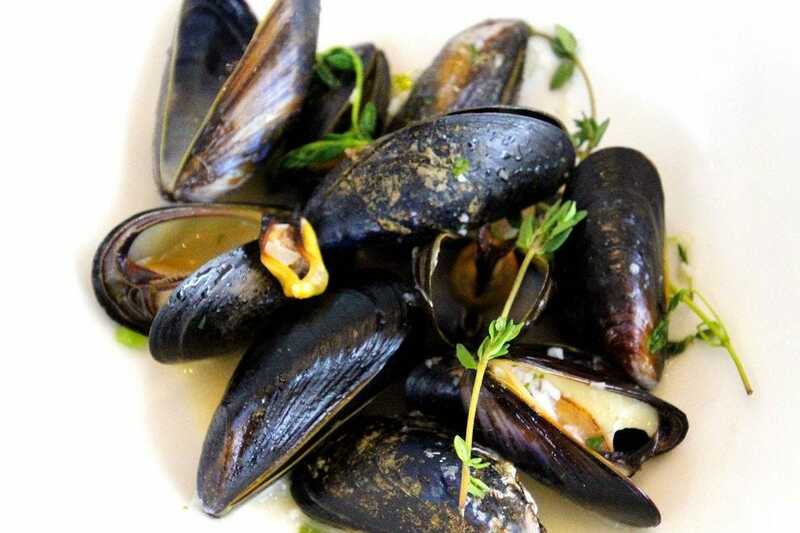 The crystal-clear waters around the islands are some of the most productive in the world, and yield an abundance of fish and shellfish, such as salmon, lobster and mussels. 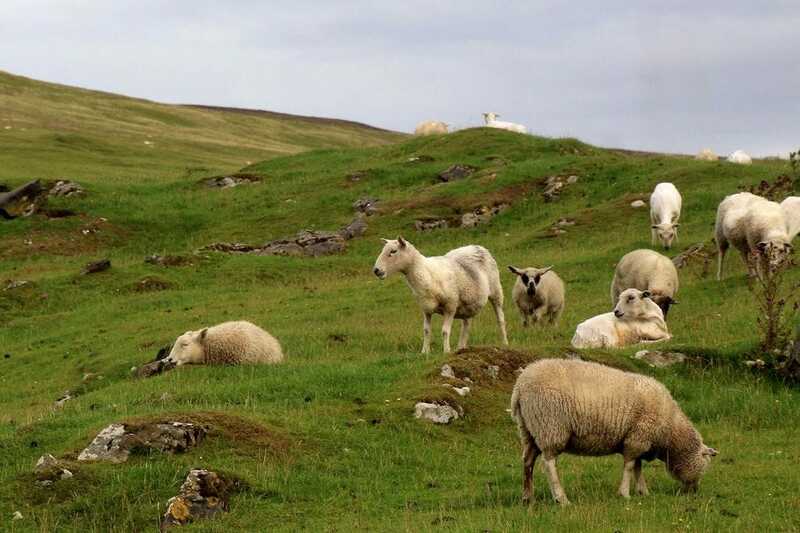 Shetland is also known for its outstanding lamb and beef, organically raised on the grass and heather moorland. It also boasts its own potato, the flavorful Shetland Black. 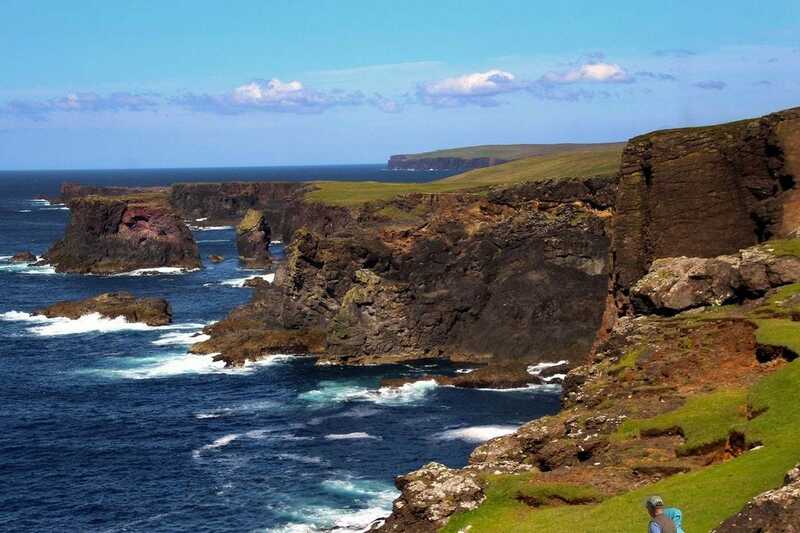 The magnificent drive from Lerwick to Eshaness is one of the most scenic stretches of road in the Shetland Islands. 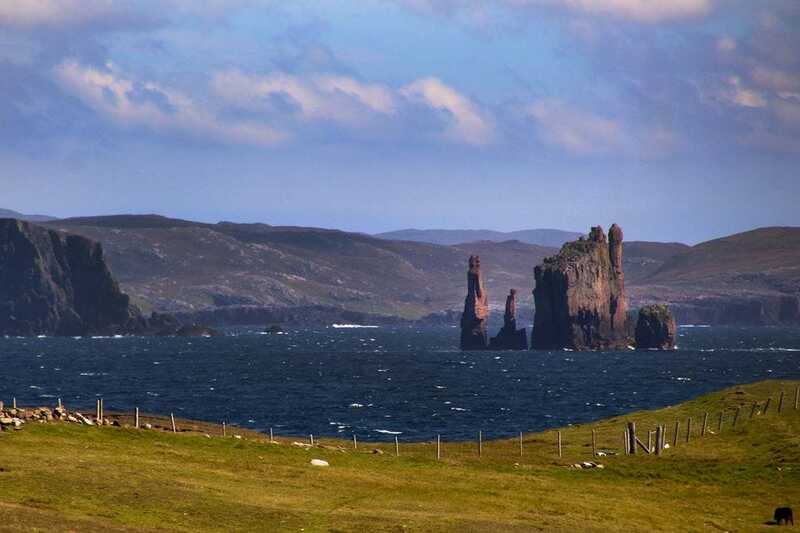 This view is on the iconic Drongs sea stacks just off the Ness of Hillswick. 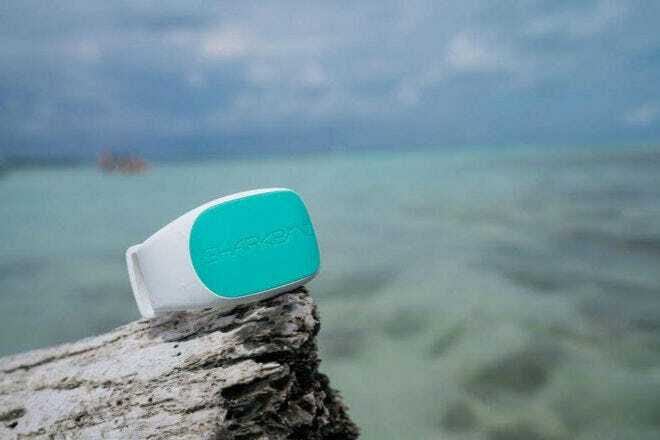 Each turn of the road brings you past magnificent vistas, so definitely have your camera ready! The Shetlands is a perfect family destination. The bairns (Scottish word for children) can't help falling in love with everything there is to discover here. 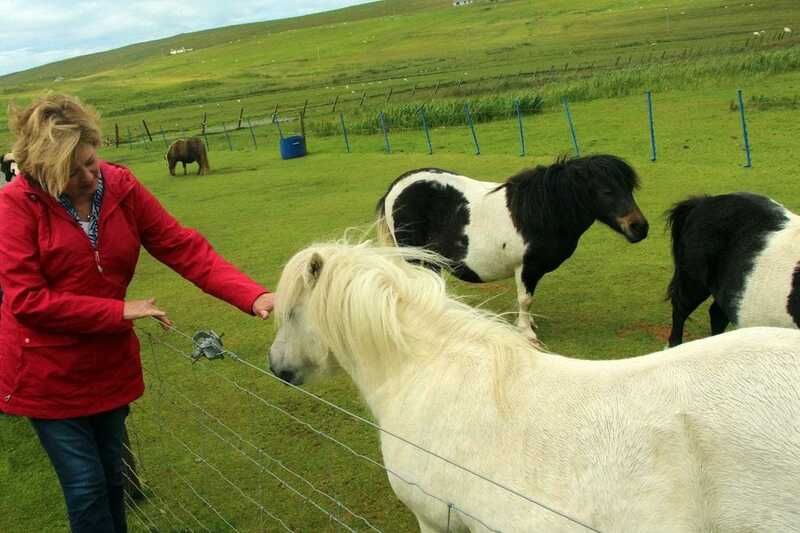 Petting zoos that feature the Shetland ponies and other animals are popular, in addition to local wildlife parks and the many nature reserves on the isles. Kids can frolic in a variety of indoor water parks and swimming pools, or enjoy a wide variety of water sports. 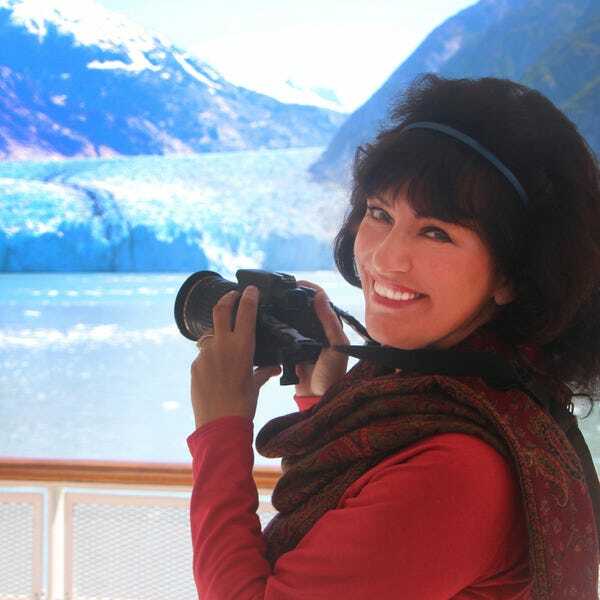 Riding the ferry to your destinations is an adventure in itself for the kids, with the constantly changing scenery and views on basking seals and other sea life. Not to mention, hiking possibilities are endless. 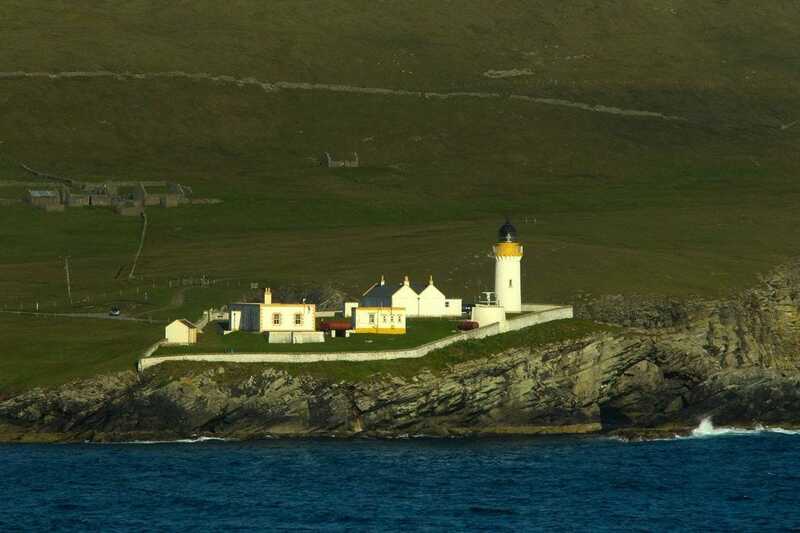 The romantic – and still active – Bressay Lighthouse is one of four lighthouses built in Shetland in the mid-19th century. Perched high on the rocky crags, the lighthouse is a five-minute ferry ride from Lerwick. 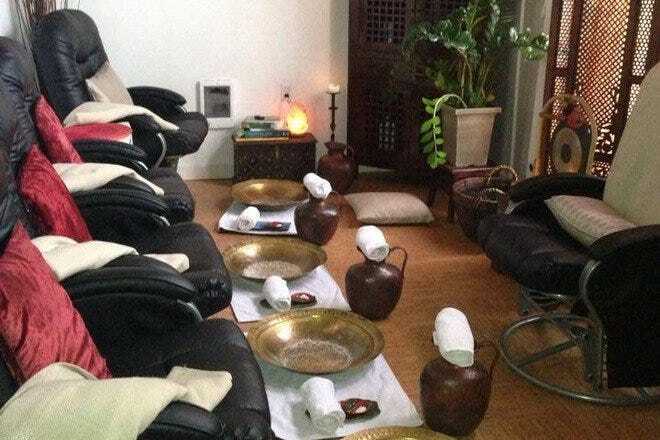 Two lighthouse keeper’s cottages, which sleep up to six people and boast uninterrupted views out over the sea and harbor, are available for weekly rentals. Locals joke that the ubiquitous Shetland sheep far outnumber the population, and that isn’t hard to believe after touring the islands. This small, but hardy breed is long-lived and produces natural, undyed wool used in the prized, multi-colored knitwear woven here. The wool produced on the Shetlands is famous for being a world-class natural fiber, with a long-standing reputation for quality. 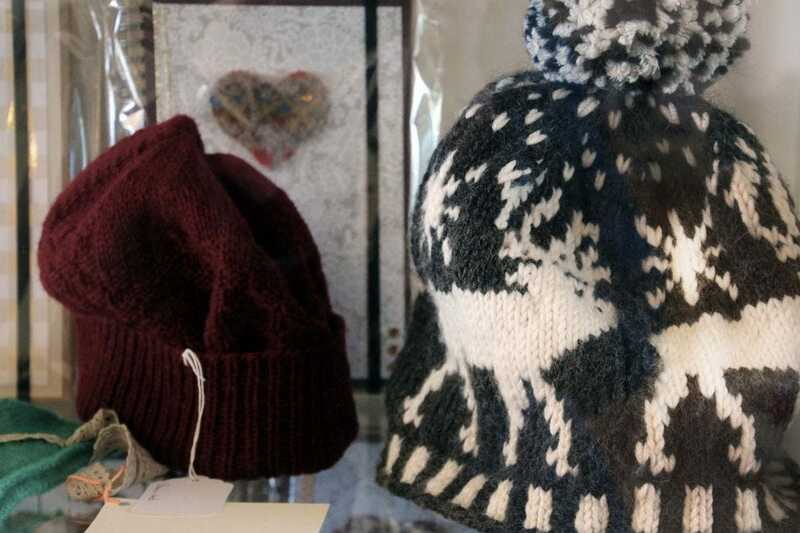 Local stores carry a wide variety of items, from hats to sweaters, guaranteed to keep you warm in any winter condition. If you've traveled through Norway, you'll have noticed trolls, mystical creatures from Norse mythology, visible in all sorts of locations in the country. 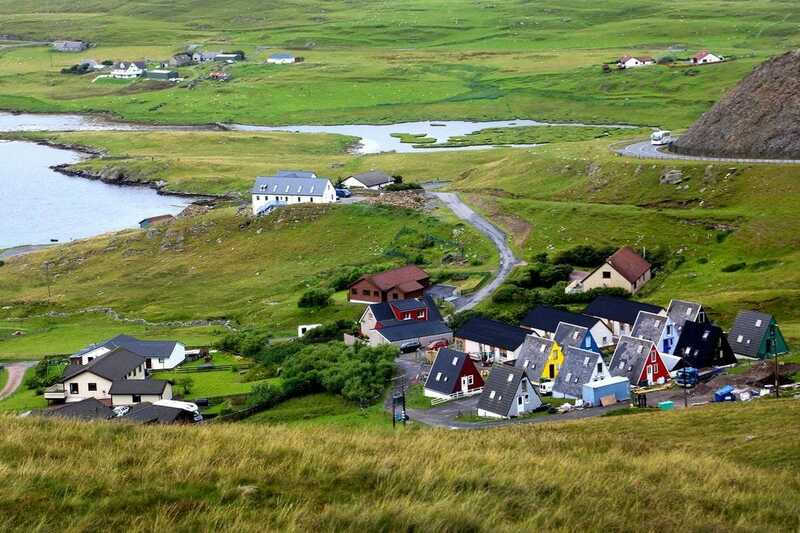 The Shetlands have their own version of the same, which they call "trows." You’ll see them perched along the road, wishing you a safe and happy voyage on your drive. For a drive of a lifetime, head to the scenic northwest corner of Mainland, traversing a landscape shrouded in peat, heather and endless lakes. When you reach the end of the road at the cliffs surrounding the Eshaness Lighthouse, you’ll be in awe at the vision before you. 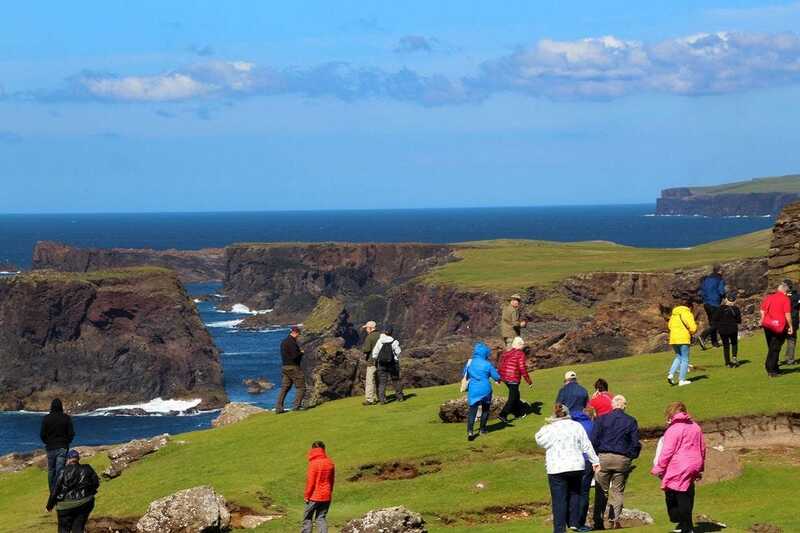 Walk along the ridge and enjoy one of the most spectacular clifftop views in the United Kingdom.